How can we grow The New York Times audience? How might we grow The New York Times audience? The core NYTimes audience is aging and current subscribers average at 60 years or older. However, the next wave of prospect readers, also our target audience, are the younger generation whose age below 40. More specifically, we focus on the ones who are already using the NYT mobile app frequently but have yet to subscribe. 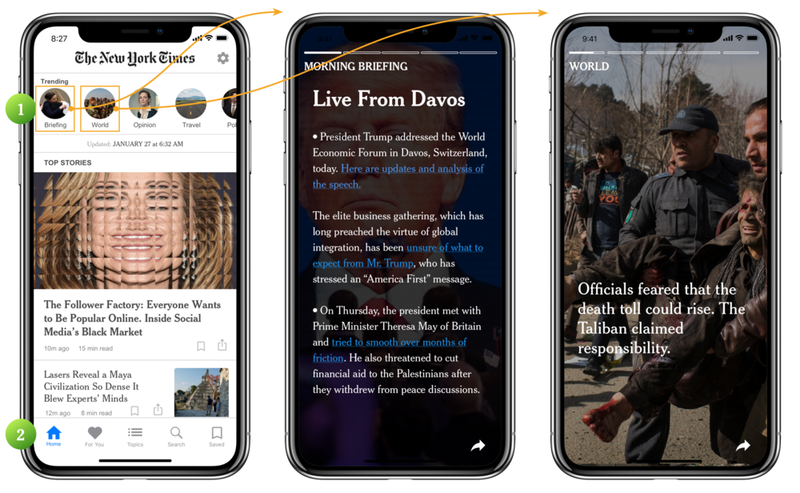 A new digital experience on The New York Times mobile application that responds to our target audience’s news engagement and retention* behaviors. *engagement: level of user involvement / retention: the rate at which existing users are returning. From the findings of our research interviews, we learned in depth about audience based on 4 main topics. Readers see the NYTimes as hard news source–Even though the NYTimes does offer lighter content which focuses on human-interest stories and lifestyle, they only expect to see content related to politics, economics, international relations, welfare, and scientific developments. The NYTimes articles have more depth–They feel that the NYTimes articles have more comprehensive reporting than competitors. In their current consumption of news, they typically choose speed over credibility, wanting the latest information as quickly as possible. They don’t mind having lighter and heavier content side-by-side because ultimately because they want to walk away with a more enriched life. For non-news readers, the research shows that they primarily look for guidance and inspiration. They prefer real time top news on the home and don't associate the NYTimes with lifestyle content. This means people only use the home view to scan through headlines, and not even read the excerpt. Non-subscribers simply Google the topic and find the information elsewhere. Because the home page is simply a feed of top news, they feel it lacked context. They aren’t attracted to the story images even though they identify themselves as visual people. They get overwhelmed by lengthy articles and need earlier expectations on reading time. 1. Stories–Snapchat-like feature shows sequences of editor's picks of news and articles that expire after 24 hours. 2. Navigation bar is relocated to the bottom of screen for easier and more visible access. It also encourages the users to explore other features besides "news". 3. News sections' title becomes a floating bar to help the users orient themselves while scrolling through the home screen. 4. Badge shown up after the users save/bookmark articles to remind them to read later. 5. "For you" section for the users to customize list of articles based on their personal preferences, so that they also receive life-style content besides news. 6. The users have the ability to like or dislike an article, which helps to improve the content delivery algorithm.